ASEM is an Italian company that has been operating for over 25 years in the market of PC-based industrial applications and since 10 years in the Industrial Automation. The company is known for the quality of its systems, entirely designed, industrialized and manufactured in Italy, and appreciated for the ability to control directly and deeply all the basic technologies of automation systems. ASEM provides HMI, remote assistance and control solutions, using "open and standard" hardware platforms integrated with flexible and easy to use software solutions. The intense R&D activity that characterized the entire 2012, has allowed ASEM to present new families of Fan-less Panel PC, Fan-less Box PC and Industrial Monitors. The Fan-less Panel PC family HT700, based on Intel Atom E6XX processor is available with 6.5", 8.4", 10.4", 12.1" and 15" (4:3), 7", 15.6"and 18.5" (16:9) display sizes. The Fan-less Panel PC family HT2000 is based on Intel Atom D2550 processor and has display sizes of 10.4", 12.1" and 15"(4:3), 17" and 19" (5:4) and 15.6", 18.5", 21.5" and 24" (16:9). The HT2000 is available also in the Fan-less Box PC version, PB2000. 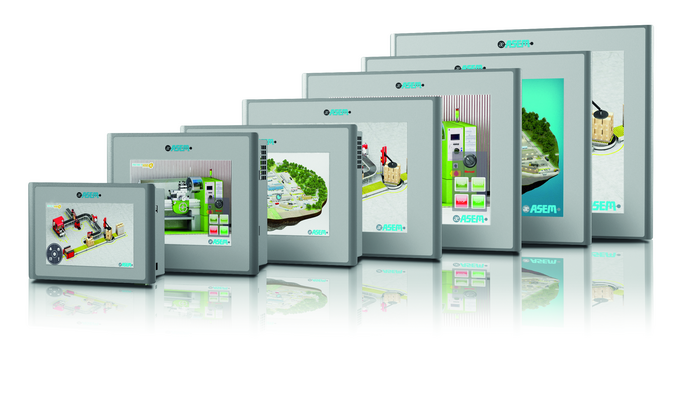 ASEM operator panel families, HMI25 and HMI30, are based on the ARM Cortex A8 processor (1 GHz) and are available with Aluminium or Aluminium True Flat front panel (all LCD sizes from 4,3" up to 15,6") and degree of protection IP66 (Enclosure type 4X, indoor use only). According to the supplier, HMI25 and HMI30 are the only operator panels in the market that integrate a remote assistance software platform, making their price competitive. The same service is normally offered only with HW+SW dedicated solutions that on average cost not less than 400 Euros, often exceeding the HMI cost. Premium HMI platform comes from a powerful and full-featured SCADA development. The strength of the platform is its transversality that allows the use of the same HMI project on both ARM and X86 hardware platforms and with both Win CE or WIN 32/64 Runtimes, without any need to modify or change settings in the development tool "Premium HMI Studio". PHMI's features include data logging support on relational and textual DB (CSV/XML), networking with client/server architectures and father/child projects, changes traceability for CFR21 Part 11 compatible applications, VB Script and VB.NET scripting with multithreading execution and on-line debugger, multi-protocol support with data transfer function between communication channels, OPC Client interface, advanced PDF and printed reports, a wide range of library vector symbols, etc. In February 2013, ASEM presented the "Premium HMI mobile", the first ASEM App available for free on the App Store and Google Play, that brings the HMI projects directly on iOS or Android devices connected in wi-fi to the HMI's LAN, enabling a mobile and multi-touch control interface for machinery and equipment. In May 2013 the supplier will release Premium HMI 4, that will integrate a new library of XAML graphic objects, available for Win CE and Win 32/64 (one of the few solutions on the market with XAML graphic interface available on Win CE), offering objects with enhanced aesthetics and ergonomic design that will enable the development of unparalleled user interfaces. The software platform UBIQUITY is a solution for remote assistance and remote control that enables the access to supervision and control systems (IPCs, operator panels and devices with Win 32/64 and Win CE O.S.) and to the automation devices connected to the Ethernet and Serial sub-network (PLCs, drives, inverters, etc.). Support teams can now operate programming, debugging and updating remote devices as if machinery installed all over the world were connected to the corporate network, without the need to install any development tool on the remote IPC and obtaining total availability of key human resources while making customers' support. 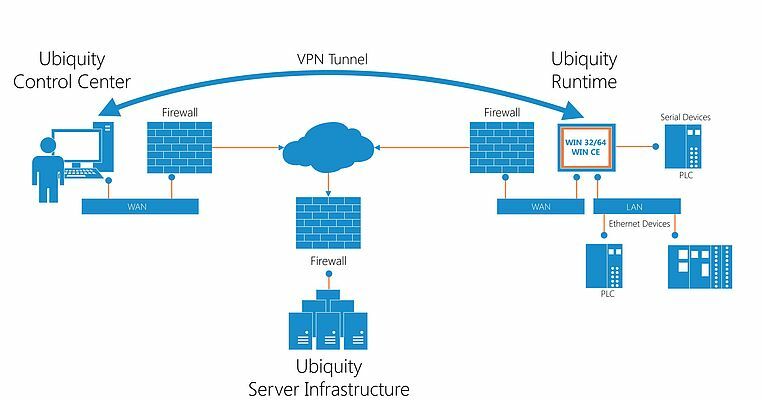 Unlike the proposal of its main competitors, UBIQUITY does not require additional hardware and enables the transparent management of remote systems, as if they were connected directly to the corporate network, excluding any intervention of network administrator for NAT, proxy, firewalls, public IP or reserved ports. Ubiquity is available also for third party IPCs and devices. In 2012, with the collaboration of an important customer, Breton S.p.A., manufacturer of high speed CNC machining centers and stone processing machines, ASEM UBIQUITY won the "Windows Embedded Intelligent Systems Partner Excellence Award" in the category Global Manufacturing, that each year awards Microsoft partners that developed intelligent and creative solutions which solved specific issues to their customers. Breton decided to install UBIQUITY on all their plants and machinery spread around the world resulting in an overall 30% saving on service costs, reducing on-site assistance and reaching a level of service and proximity to customers never achieved before. 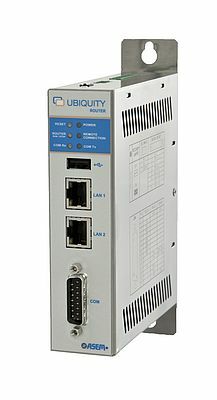 To extend the range of remote assistance solutions, ASEM released UBIQUITY Router, the HW+SW solution that brings UBIQUITY remote services on every automation system, such as machines operated exclusively by PLC, or machinery where the IPC/operator panel have operating system different from Win 32/64 or Win CE.